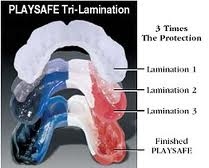 For the highest level of comfort and protection, a custom mouth guard fitting is recommended. It is created specifically for the optimal protection of YOUR mouth. It is created with thin plastic that is hardened to protect your teeth. The thinness of the custom mouth guard allows for easy breathing and also allows for easy communication (especially important for you star quarterbacks calling out the signals). Ask us about a custom mouth guard to protect your teeth and ensure that you maintain the highest level of performance on the field, court, or rink.